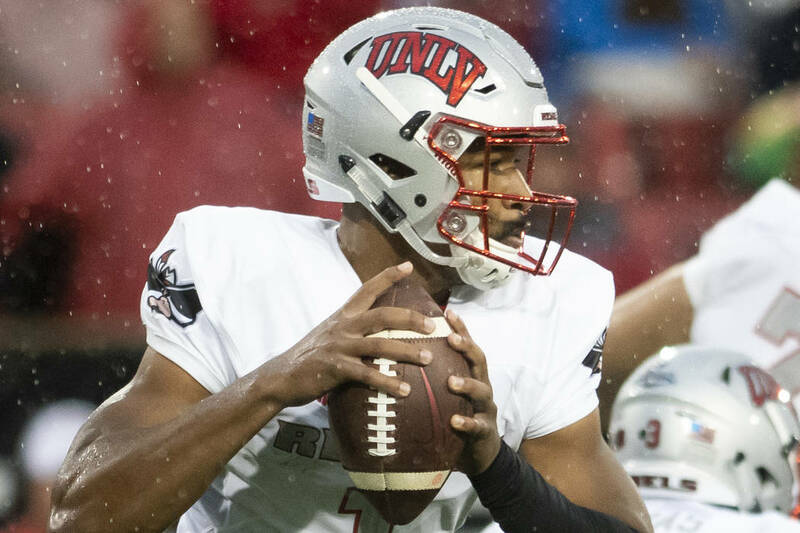 UNLV sophomore quarterback Armani Rogers is out for about six weeks because of a torn plantar plate in his big toe, coach Tony Sanchez said Monday. Sophomore Max Gilliam will start Saturday against New Mexico at Sam Boyd Stadium. Not since Jon Denton in 1996 has a UNLV quarterback started every game of a season. That streak, unfortunately for the Rebels, will remain intact. Sophomore Armani Rogers could be sidelined for six weeks because of a torn plantar plate in his big toe on his left foot, coach Tony Sanchez said Monday. “It could be longer or it could be shorter, but right now we’re putting indefinitely on it,” Sanchez said. Sophomore Max Gilliam will start for the Rebels against New Mexico at 1 p.m. Saturday at Sam Boyd Stadium. He is a junior college transfer who originally was a four-star recruit and began his college career at California. Gilliam (6 feet 3 inches, 195 pounds) enrolled early at UNLV and went through spring practices. That extra work plus the timing of a bye week for the Rebels gives Gilliam and the coaches additional time to prepare for the Lobos. Gilliam, who turns 21 in November, completed 68.2 percent of his passes for 1,185 yards with 10 touchdowns and seven interceptions last season at Saddleback College in Mission Viejo, California. He will be backed up by freshman Kenyon Oblad (6-3, 185), who threw for a state-record 11,828 career passing yards at Liberty High School. Rogers was on his way to a potential 1,000-yard rushing season before the injury, and leads UNLV with 488 yards and six touchdowns. As a passer, he has completed 41.5 percent of his throws for 369 yards with six touchdowns and four interceptions. Rogers was injured in the fourth quarter of the 27-20 loss at Arkansas State on Sept. 22. The injury was not thought to be serious, with Sanchez saying last week that he expected Rogers back soon. Rogers wore a walking boot last week and didn’t practice. The extent of the injury was discovered over the weekend. More Rebels: Follow all of our Rebels coverage online at reviewjournal.com/Rebels and @RJRebels on Twitter.